If I knew then what I know now, I would have a lifetime of touchable memories. IT IS NEVER TOO EARLY TO MAKE A "MEMORY"
100% of the price of the items I create will go to the customer's choice of non-profit organization. I LOVE what I do. My one-of-a-kind creations come from within. I feel so much joy in what I do. I step back and look at all I have done and feel the pleasure in the creations. In trying to help someone deal having to move away from her beloved pet, I came up with the idea of memory pouches. When I told her I would make her a memory pouch, I had no idea what it would be. I went home and sat with the idea and my first memory pouch was created. 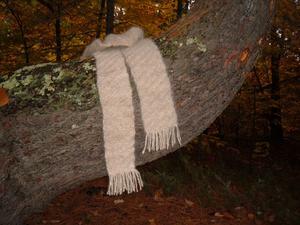 I had started making my hand dyed, hand spun, hand knit purses originally. Then came the hugs and pouches and finally the needle felted sculptures. I pride myself in taking ideas from no other place but inside myself. This way I stay true to myself. I like looking at something that I have created and being totally fulfilled by the idea. Custom made bride and groom snowcouples are custom made and labeled. They are approximately 8" tall and start at $150.00. Do you ever wonder what to do with the hair you brush or clip from your pet? 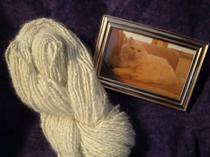 Most people don't realize their favorite pet's hair may be able to be spun and knit, just like sheep's wool. Soft as cashmere or angora, this black change purse was made from the hair of my Belgian Sheepdog, Hobbes. I also have made this memory pouch out of 100% of Hobbes hair with a baked clay bottom with his paw print in it and a baked clay slide made in the shape of a sock in the colors in his collar. Since the only thing that Hobbes will retrieve is a sock, I made the slide into that shape for an added memory. Sadly, although young and healthy now, someday Hobbes will be gone and I will always have these special ways to keep in "touch" with his memory. This is Cuddles and the yarn that was spun from 100% of her own hair. It is so nice and soft. I haven't heard as yet what her owner has made from the yarn. ALL INFORMATION AND ITEMS SHOWN ON THIS WEBSITE "TACTILE COMFORT CREATIONS" OR IN THE BROCHURE OF THE SAME NAME ARE EXCLUSIVE CREATIONS OF JANET GRAHAM OF TACTILE COMFORT CREATIONS AND NOT TO BE COPIED OR RECREATED. Gift certificates are available on the Custom Spinning page. Also seen on Concord Community Television's "Tell It Like It Is: Small Business" in the show entitled "Spinning a Memory". 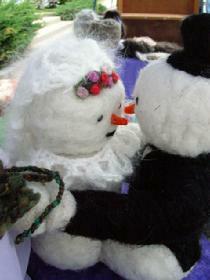 One of My Needle Felted Snowmen was featured on the cover of NH Magazine, December 2009 and also a bride and groom needle felted couple in the NH Bride Magazine for Fall and Winter 2010. Many thanks to the editors at NH Magazine for giving me these opportunities.